Networking vendor Nokia has launched the fourth generation of its bespoke silicon, which forms the core of a major new IP routing portfolio. The silicon is called FP4, which Nokia is claiming is the world’s first multi-terabit chipset and is six times more powerful than today’s best network processors. Telecoms.com spoke to Steve Vogelsang, CTO for Nokia’s IP and optical business, and he explained that the unique needs of network processors require them to be designed from the ground up. With this launch Nokia seems to be positioning itself as a market leader in this area. This the FP4 at the core Vogelsang said Nokia is able to offer IP edge routers – which are responsible for much of the internet backbone – that have a significantly higher capacity than those offered by the likes of Cisco, Juniper and Huawei. Apart from capacity, the other claims being made on behalf of this generation of routers is an improved level of built-in analytics, which should help to automate networks and future-proof them in anticipation of SDN. Nokia is also heralding their built-in security features that can augment defence against internet foulness such as DDoS attacks. Nokia also managed to get some customers to talk up the launch. “With demand continuing to rocket, together with more cloud-based applications, innovations like Nokia’s new FP4 silicon and routing platforms allow us to maintain our commitment to our customers by balancing capacity, intelligence, visibility and security, so we can transform to an insight-driven, automated networking approach for building and operating our networks,” said Neil McRae, BT Managing Director and Chief Architect. If this launch really does improve core network capacity significantly then it’s good news for everyone. Recent BT announcements show how keen operators are to future-proof their networks and with capacity demands continuing to increase exponentially it’s easy to see why. 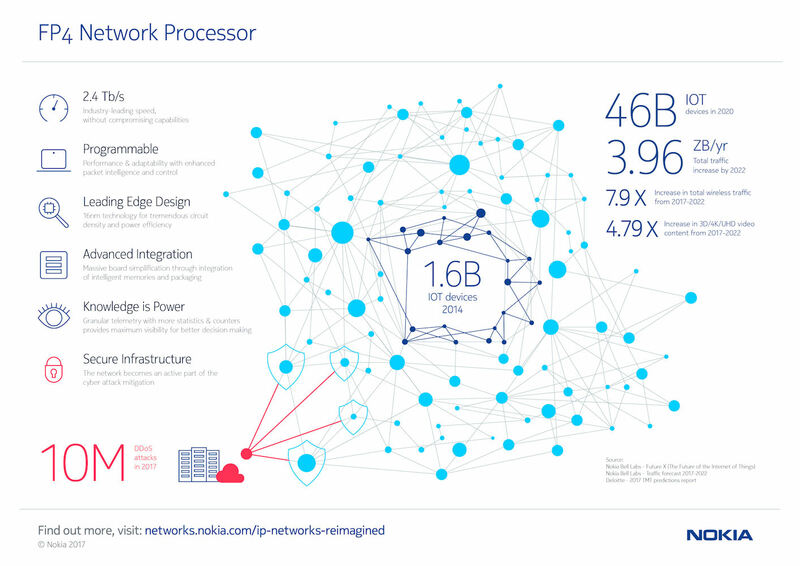 Here’s an infographic and a nice corporate vid Nokia produced to introduce all this networking goodness.